Just 51 weeks after I asked Chelsea to move to Seattle, I took her to the Pacific Coast and asked her to spend the rest of her life with me. She said ‘yes‘. I’ll let Chelsea tell you about it in her own words. Feel free to read more on The Knot. Rain, Sleet, Snow and Sunshine. Landon had planned a surprise day trip for us and we set out early in the morning. After wearing him thin from begging for more details of our adventure, he finally caved, telling me where heading to the coast. 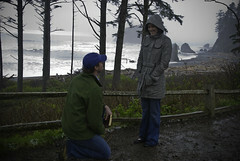 We took the 101 towards Ruby Beach and discovered the amazing beauty this location held. However, I was content in viewing all this from the car…remember, sleet. He encouraged otherwise, so we set out towards the water. With my feet now soaked and my hands numb, Landon kept his cool while I continued to complain. Once he found ‘the’ location, he set up his camera for us to take a photo together. Freezing and not understanding why we needed this photo in this weather at this moment, I kept trying to persuade him to just take some photos so we could go back to the warm car. Once the camera was ready, he came near…and then dropped to his knee. It could have been hailing golf balls and all I know is that at that moment I could have cared less. He talked about the ‘horrible’ weather we were having at the moment but how he didn’t care, he talked about wanting to bring me to this spot since I first moved to the Pacific and eventually took the 101 to get to him…(I can’t remember the rest, but it was all perfectly sweet!). He presented me with our family bible that already had ‘The Howell Family’ engraved on the cover. It was incredibly sincere and we both soaked in the moment. Literally, we were soaked. After calling our parents, we continued down the coast and the sun began to shine. You two have made us very happy and proud! We feel so blessed to have Chelsea in our family and look forward to years of laughter, love, and life. We celebrate with you and thank you for letting us be a part of your lives. Wonderful. Go for it the rest of your lives. We have 45 years of marriage and are in the best years of it. I wish you the same. Conrad’s oldest living brother. Landon, we are so happy that you and Chelsea are getting married. We already love you and your parents…and we know that you two were made for each other. We only wish you both the very best of everything that life has to offer. Congrats! So happy for y’all!!! …and I love the big goofy grin on Landon’s face. Congratulations! Now move back to Mississippi! Congratulations! May God Richly Bless! Landon, I’m so happy for you! How amazing for you to have captured the whole thing on camer, awesome! And I still don’t know you, but I know how much he wanted this even before it happened. He’s the neatest person I know, so talented, so funny, so entertaining, and I know that it takes a VERY special someone to 1) catch his eye 2) captivate his heart 3) compliment him — all of which I KNOW you do.